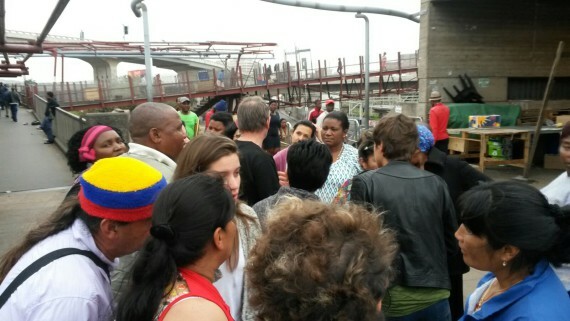 Piesang River – the home of the South African Federation of the Urban Poor (FEDUP), a meeting place filled with sounds of Portuguese, isiZulu, Spanish and English, a place filled with expectations of what a four-day learning exchange might hold for its participants – representatives of urban poor networks from across Ecuador, Colombia, Brazil and South Africa. Are there joint mobilisation strategies? How does each movement build partnerships? 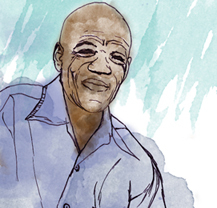 And what does advocacy from the perspective of community leaders look like? These questions shaped the purpose of the four-day learning exchange from 21-24 September in South Africa’s east coast port city, Durban. What brought together representatives from such different locations? Their affiliation to SDI (Brazil & South Africa), WIEGO (Colombia & Asiye eTafuleni, South Africa) and Fundacion Avina (Ecuador). 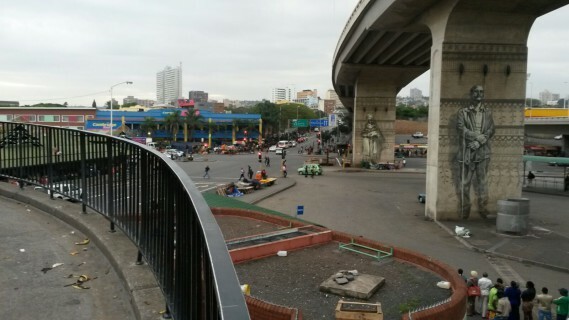 All three are global movements of the urban poor. Although their approaches may differ, SDI, WIEGO and Avina share the vision of building equitable, just and inclusive cities. 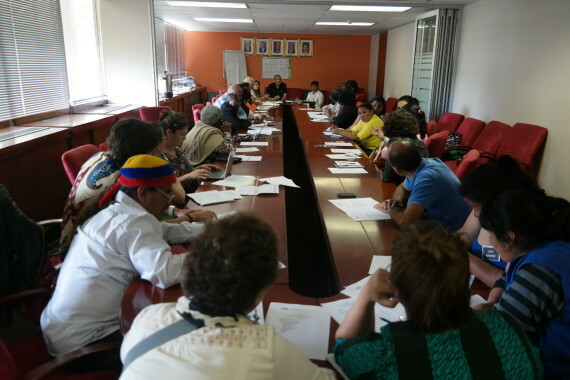 The learning exchange was convened by Cities Alliance, of which WIEGO and SDI are both members. 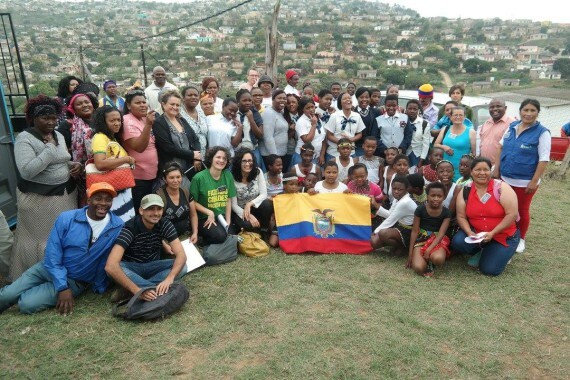 Envisioned as a two-part exchange, the first was hosted by SDI in South Africa, while the second will be hosted by WIEGO in Colombia. The exchange focussed on exposing the visitors to the South African Alliance’s approaches to- and outcomes of community organising. This included a visit to housing and informal settlement upgrading projects, a savings scheme, conducting practical data collection, a partnership meeting with government and getting to know the context of informal workers. Incidentally, Piesang River also displays the fruits of FEDUP’s militant negotiation with national government around housing delivery. FEDUP leaders explained that the vast housing settlements in Piesang River and Namibia Stop 8 (a further area visited that afternoon) are a result of their success in convincing government to grant members direct access to their housing subsidy. This enabled them to self-build larger houses, culminating in the adoption of the People’s Housing Process (PHP) policy. Although it has not been without its challenges, PHP represents a breakthrough in altered approach from “delivery” to “collaboration”. In contrast, community leaders of the Informal Settlement Network (ISN) elaborated on their difficulty in achieving breakthrough in municipal support for informal settlement upgrading. 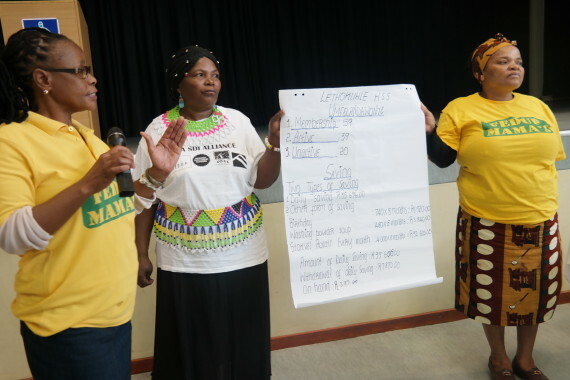 With over 2700 informal settlements in the country and an increasing housing backlog, the ISN supports communities with tools and plans for negotiating with local government around service delivery through incremental upgrading. During a visit to Mathambo settlement, community leader and regional ISN coordinator, Ndodeni Dengo explained that despite the settlement’s relatively small size, existing structures were located in high density to each other, with most not larger than 9m2 – and a deficit of water, sanitation and electricity services. 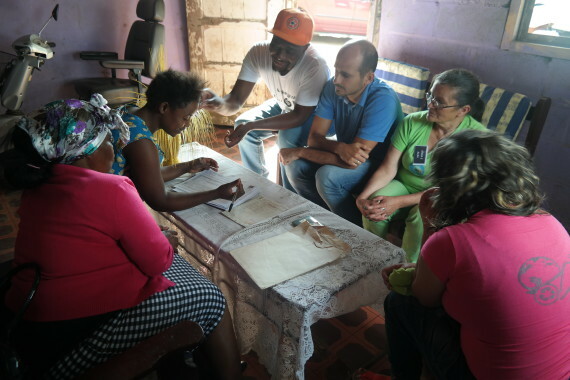 The community had collected data about its settlement through a detailed household level enumeration that helped them negotiate upgrading plans with the local municipality. By using wooden boxes for planning a new layout that would enable service installation, the community established their ideal design for the upgraded settlement. How do urban poor communities organise? Over the next two days the visitors were introduced to the driving force behind FEDUP and ISN’s housing and upgrading projects: the practice of daily savings and data collection as tools for community organisation. At Kwa Bestar savings group, the visitors saw that saving is not primarily about collecting money, but about collecting people. Savings groups are a space where trust is nurtured through daily saving, sharing needs and identifying common solutions. At present, the group of 39 active members has saved US$ 2800. It is also engaged in forming smaller saving units to access loans by generating income through small businesses. The keen involvement of young people aged 8 – 25 in the savings process was a special highlight. 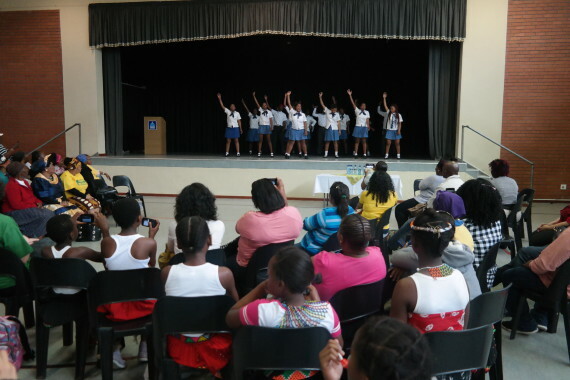 Once more it became evident that savings is about growing and enabling people, showcased by the rich dance, drama and music performances by the youth. This is how data collection through settlement profiles (of a settlement’s history, infrastructure, conditions) and enumerations (detailed household level surveys) enables partnership with local government officials. 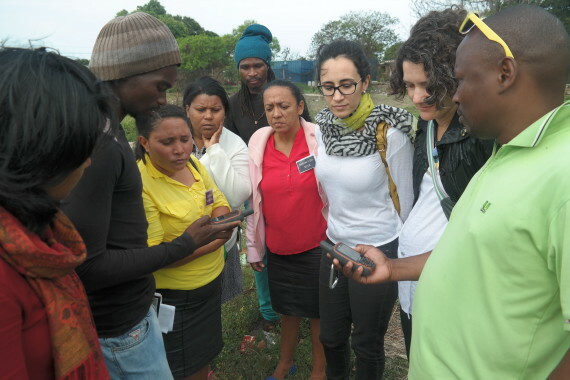 When walking around the area, the group mapped the settlement boundaries and landmarks such as water and sanitation points on GPS devices while others spoke to residents, collecting household data by using the Alliance’s enumeration form. 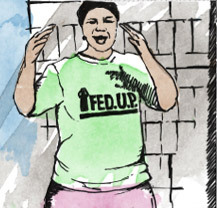 It is through savings and data-collection that SDI’s urban poor federations leverage partnerships: saving contributions show self-reliance and community will; settlement-wide data powers a community’s negotiation capacity. 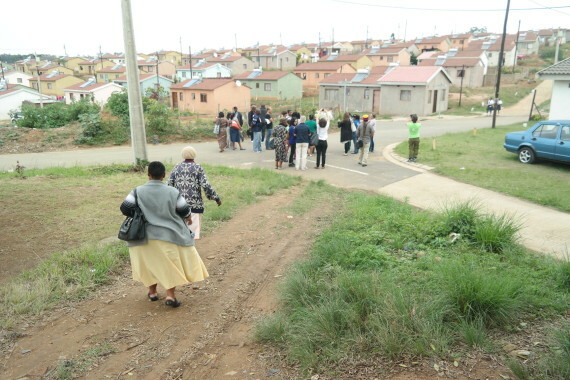 On day three the visitors accompanied the Durban Alliance to a meeting with the local municipality, province and a representative from national government, discussing the progress of housing and upgrading projects. The visit to Asiye eTafuleni (AeT) added rich insight to the experience of informal workers and an added dimension to partnership building with local authorities. The group was introduced to AeT’s work in developing inclusive spaces that support sustainable livelihoods for informal workers. 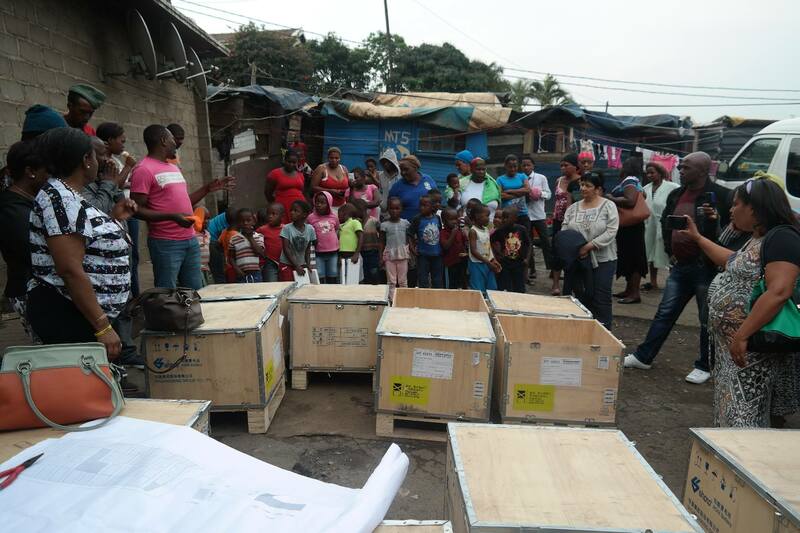 The shared realities of informal settlement dwellers and informal workers became particularly evident on a walk-about through the bustling Warwick market in Durban’s inner-city. For AeT and the SA SDI Alliance the encounter highlighted similarities and differences in approach but most of all established a platform for increased collaboration in the future. With a rich collection of experiences and impressions, the group gathered on the last morning to reflect and share on the …. Prepare for Joint Lobbying at Global Events such as Habitat III. As the global development community gears up for Habitat III, global movements of the urban poor are establishing a firm coalition. This learning exchange forms an integral part of that process, “allowing networks organised around livelihood and habitat to come together, share their experiences and strengthen their capacity to organise and advocate in favour of the urban poor” (Cities Alliance, Exchange convener). When speaking with a united voice, advocacy has the potential to influence policy discussions on increased collaboration between communities and governments.